How are you guys doing? Feb month is going full swing. What you guys planning for Valentine’s Day? I have got loads of reviews for you this month 😊. 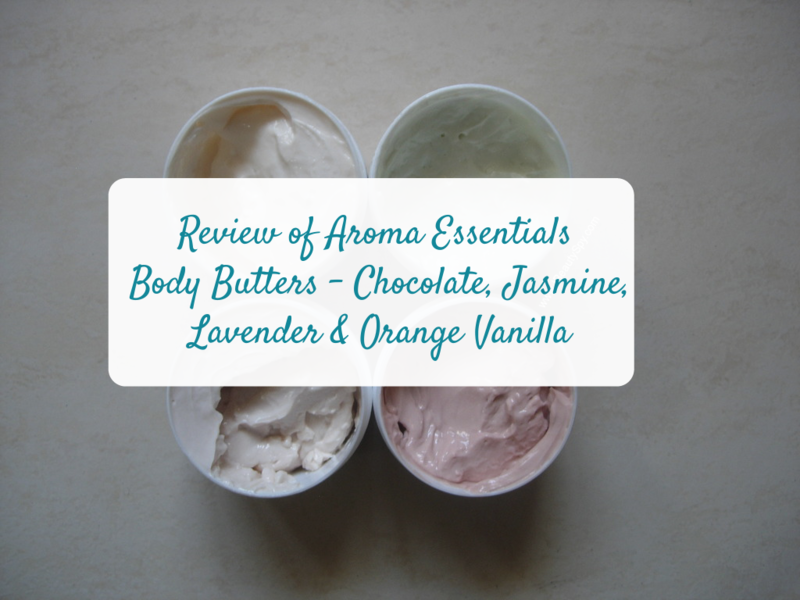 Today let’s review some body butters from the brand Aroma Essentials. Am a regular user of body butters since I have very dry, parched skin and I use them up pretty fast. 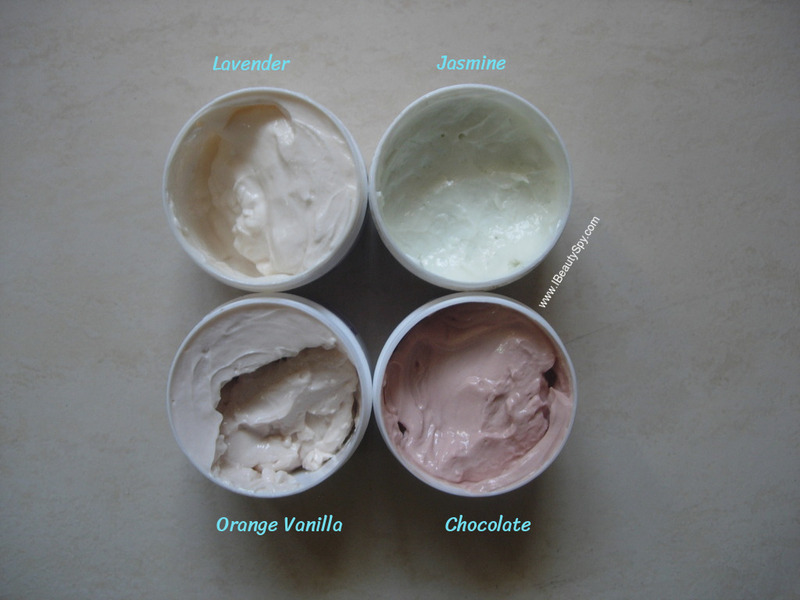 I got 4 variants of body butters from Aroma Essentials – Chocolate, Jasmine, Lavender, Orange Vanilla. Let’s see how they perform. Rs.650 for 120g and Rs.410 for 60g. Aroma Essentials body butters come in two sizes – 60g and 120g. I got the 60g ones and these are really travel-friendly. They will even fit in your handbag. You can carry them to office and apply on your hands and elbows whenever needed as working in A/C office can dry out your skin faster. Aroma Essentials Chocolate Body Butter looks brown in color and has a yummy chocolate scent. It is not very strong though and won’t make you smell like a cake if you fear that 😅. The Jasmine Body Butter looks pale white with a slight greenish tint. It has a lovely soothing floral scent of jasmine. This is best for applying before going to sleep. The Lavender Body Butter looks white in color and has a relaxing aroma of lavender essential oil. The Orange Vanilla Body Butter is my favorite and has a warm vanilla scent with a hint of citrusy orange in it. Perfect for winters. All the variants of Aroma Essentials Body Butters are thick, buttery creamy, emollient and nourishing on the skin. It contains a blend of the 4 super butters – cocoa, kokum, mango and shea. These help to keep your skin soft, smooth, moisturized and healthy. They are especially great when used on foot as they help to heal rough and cracked feet. Also they don’t make your skin look too oily or greasy as they get absorbed easily. The scent is not very overpowering but just the right subtle way and long lasting. I would recommend you to apply them on your elbows, knuckles and cuticles too to as these are dry areas which we often ignore and they become rough and hard. These butters will soften and beautify them. A small tip would be to use body butters on slightly damp skin so they blend and absorb more easily and also you need lesser amount. This is just my choice. However if you like chocolates more, your order would be different. I would recommend getting this trial pack of all 4 variants so you can try and see for yourself. 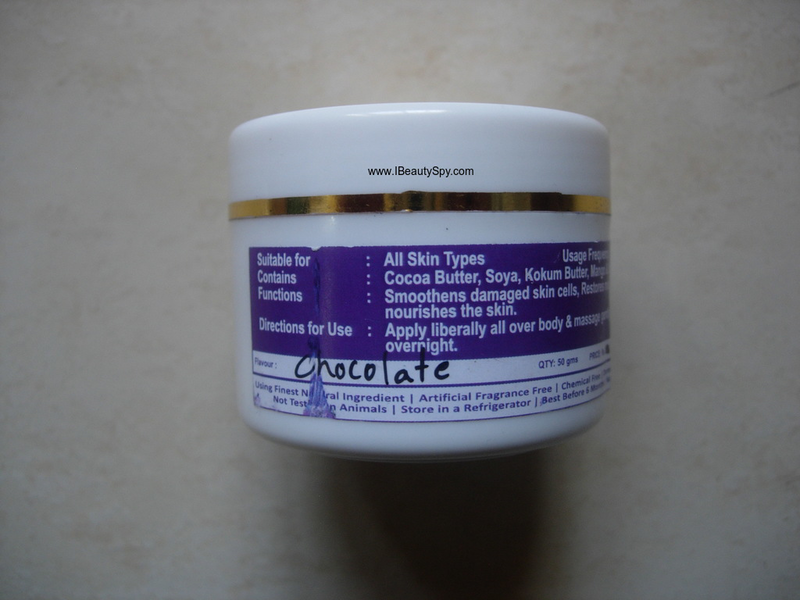 Cocoa butter is naturally high in vitamin E to hydrate and soothe skin. It is rich in anti-oxidants and also reduces inflammation and discolorations. Kokum butter helps revitalize skin while supporting elasticity and flexibility. It is rich in essential fatty acids, vitamin E and is non-comedogenic and easily absorbed. Mango butter provides skin softness and soothes sun damaged skin. It is rich in vitamins A, C and E. Promotes plump and firm skin. Shea butter, the best among all, increases collagen production, strengthens and improves skin elasticity. It contains vitamins A, E and F and also essential fatty acids. * Great choice of ingredients – a mix of the 4 super butters. * Thick and emollient texture. * Moisturizes and nourishes skin deeply. * Rough skin is made softer and smoother. * Doesn’t make skin look oily. Gets absorbed quickly. * Subtle but long lasting fragrance. * Comes in various scents to choose as per your preference. * Its pricey, unless you get it on a discount. If you wish to try some natural, handmade body butters, give Aroma Essentials a try. They have various scents from floral to citrusy to yummy ones. You can choose one or go for this trial pack where you can try all the variants and which is more economical. I would highly recommend incorporating a body butter in your routine as they have anti-aging benefits and help improve skin elasticity, firmness and prevent wrinkles in the long run. Do you love body butters too? Which is your favorite body butter? Do share in the comments below. The chocolate one is calling my name. Such a great post- now that I know that the quality’s there, this is definitely going on my wishlist!